Although Gloucester came to be revered as a club of the people, drawing both players and supporters from all levels of society, it started as a much more exclusive club. The founding members in 1873 included 3 solicitors, 2 corn merchants, a magistrates’ clerk, a banker’s clerk and the first clerk of the Gloucestershire County Council. For the first nine years the Club did not allow working class men to join. However, the Club members did feel a responsibility to promote the game locally by establishing junior clubs. It was at one of these junior clubs, the St Luke’s Red Cross Club, that George Coates, a labourer at the Gloucester Wagon Works, played his early rugby (although he would have referred to it as simply “football”). The breakthrough came as a result of pressure principally from A W Vears, who exercised considerable influence as Chairman of the Club, and Frank Brown, the Captain. They believed that the Club should be open to all, were ambitious to improve and expand the fixture list, and were keen to increase the playing strength of the Club. 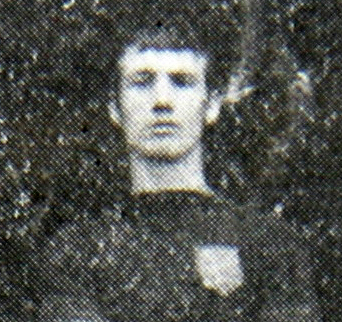 The first working class player to break into the team was George Coates, who was selected for the Gloucester team in the third game of the 1882-83 season. His first appearance was on 14th October 1882, in a game won by 3 goals and 2 tries away to Swindon Rangers. The following week he played at the Spa in the first encounter between Gloucester and Cardiff. George scored his first try, and Gloucester ran out winners by 1 goal and 7 tries. In his third match, George scored his first hat trick of tries, contributing handsomely to Gloucester’s win at the RoyalAgriculturalCollege, Cirencester, by 2 goals and 2 tries to 1 goal. This was just the start of Georges’ prolific try scoring – after a 0-0 draw with Newport, he scored in the next 4 games – 2 against Cheltenham College, 3 against Bath at home, 1 against Bath away and 1 against Newport away – all games won by Gloucester. By the end of the season, George was the leading try scorer with 11 tries from 11 appearances. This enabled the Club to finish with a record of – Won 11, Lost 0, Drawn 3; Scores For 16 goals and 35 tries, and Scores Against 1 goal and 6 tries. This is the only time in their history in which Gloucester have gone through a whole season unbeaten. The team became known as “The Invincibles”, and days of social exclusion from the Club were over for ever. George duly recommended his best friend and fellow labourer at the Wagon Works, Tommy Bagwell, to the Club in 1883, and after Tommy had scored 5 tries in a 2nd XV match, they were soon playing alongside one another, with George in the three-quarters, and Tommy playing inside him at outside-half. The two of them were to go on to play an important part in several years of success for the Club. In 1883-84, Gloucester expanded their fixture list to 19 matches, and George kept up his record of a try a game, as he scored 14 tries from 14 appearances. He missed the first 3 games of the season, and played a game for the 2nd XV against Tyndale White Cross on 25th October 1883, in which he scored Gloucester’s only try. This was presumably a warm-up, and 2 days later he turned out for the 1st team, and scored a try against CheltenhamCollege. Gloucester were experimenting with various formations at this time – they played 2 backs, 2 three-quarters, 2 half-backs and 8 forwards in this match, but a week later against RAC Cirencester they played 1 back, 3 three-quarters, 3 half-backs and 8 forwards – but always with George amongst the three-quarters. After Christmas 1883, George hit a rich streak, warming up with 2 tries in Bristol against RedlandPark, before running in 5 tries against Bath in a comprehensive win by 2 goals and 6 tries to nil. In successive weeks he scored 2 tries each against Clifton (won by 2 tries to nil) and Swindon Rangers (won by 1 goal and 4 tries to nil). The season ended with a record of Won 15, Lost 2, Drawn 2; Scores For 21 goals and 59 tries, and Scores Against 2 goals and 3 tries. In 1884-85, George played in 13 of the 20 fixtures, and was again the leading try scorer with 9. This included both tries against Swindon Rangers in a win by 2 goals to nil, and another brace against Redland Park at home (won by 2 goals and a try to nil). He also scored in 3 successive games against RedlandPark (away), Queen’s College (Cork) and Bath. George was in imperious form in 1885-86, when he played in all but one of the Club’s 17 fixtures. The season record was impressive with 13 wins against 3 losses, and 27 goals and 32 tries scored, against 8 goals and 9 tries conceded. George scored in 11 matches, and was comfortably the leading try scorer with 18, including 4 against Swindon Rangers at the Spa, and another two in the return match at Swindon. The Club were relatively less successful in 1886-87, winning 10 and losing 7 of their 19 fixtures. The Welsh were the problem – 6 losses and 2 draws in the 8 matches against the big 4 Welsh clubs contrasted with winning all their other games apart from the Boxing Day fixture against a London invitation XV. George was as usual the leading try scorer with 12, the next best being 4. He scored in the first 3 games of the season, including a hat trick at Bath, which secured a win by 4 tries to one. Later in the season he ran in another hat trick at Clifton, when Gloucester won by 4 tries to nil. The 1887-88 season again saw only one loss to an English club, Moseley, but the record against the Welsh only improved because there was no fixture against Llanelly – Cardiff, Newport and Swansea inflicted 5 defeats and a draw. H E Taylor was Gloucester’s leading try scorer with 11, whilst George was second with 7 from 15 appearances. He finished the season strongly with tries in 3 of the last 4 matches, including a brace against both Bath and RAC, Cirencester. George’s last season for the Club was 1888-89, when he appeared in 15 of the 23 fixtures, and scored 7 tries, including another hat trick against Clifton, when Gloucester won by 1 goal and 3 tries to 1 try on 26th January 1889. His final game was a 0-0 draw against Cardiff at the Spa on 23rd February 1889. His career record was 101 appearances and 78 tries. These are impressive statistics, but beyond his prolific try scoring, George had a much greater impact on both the immediate and future success of the Club through the part he played in opening up the Club to all, a process which his best friend, Tommy Bagwell, would take even further.